The Rocky Mountain High just got a whole lot higher. On Tuesday night, Amendment 64 — the measure seeking the legalization of marijuana for recreational use by adults — was passed by Colorado voters, making Colorado the first state to end marijuana prohibition in the United States. Although Colorado “legalized it,” it will be several months, perhaps as long as a year, before Colorado adults 21-and-over can enjoy the legal sale of marijuana. However, the parts of the amendment related to individual behavior will go into effect as soon as Governor Hickenlooper certifies the results of the vote, a proclamation he is obligated to do within 30 days of the election, The Colorado Independent reported. It’s also worth noting that 2012 is a presidential election year, so we will benefit from increased voter turnout compared to an off-year election like 2006. Historically, the more people who vote, the more support marijuana reform initiatives receive. On the same night that Colorado passed Amendment 64, Washington state passed Initiative 502 which regulates and taxes sales of small amounts of marijuana for adults, The Associated Press reports. 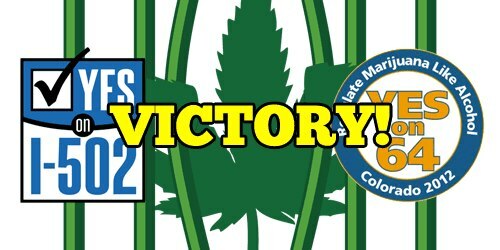 Oregon also had a similar recreational marijuana measure on the ballot, but as of publishing and with 47 percent of precincts reporting,it looked as if it would not pass. The big unknown still is if the federal government will allow a regulated marijuana market to take shape. Attorney General Eric Holder, who was a vocal opponent of California’s legalization initiative in 2010 saying he would “vigorously enforce” federal marijuana prohibition, has continued to remain silent on the issue this year. In October, those same DEA drug warriors joined by former directors of the Office of National Drug Control Policy on a teleconference call to put additional pressure on Holder to speak out against Colorado’s marijuana measure as well as similar initiatives on the ballot in Washington state and Oregon. In a report published Sunday by NBC News, President Obama’s former senior drug policy advisor said that if the marijuana initiatives pass, a war will be incited between the federal government and the states that pass them. “Once these states actually try to implement these laws, we will see an effort by the feds to shut it down,” Sabet said. The DOJ has yet to formally announce its enforcement intentions, however, the clearest statement from the DOJ came from Deputy Attorney General James Cole, who said his office’s stance on the issue would be “the same as it’s always been. “During a recent appearance on “60 Minutes” Cole elaborated, “We’re going to take a look at whether or not there are dangers to the community from the sale of marijuana and we’re going to go after those dangers,” Reuters reported.